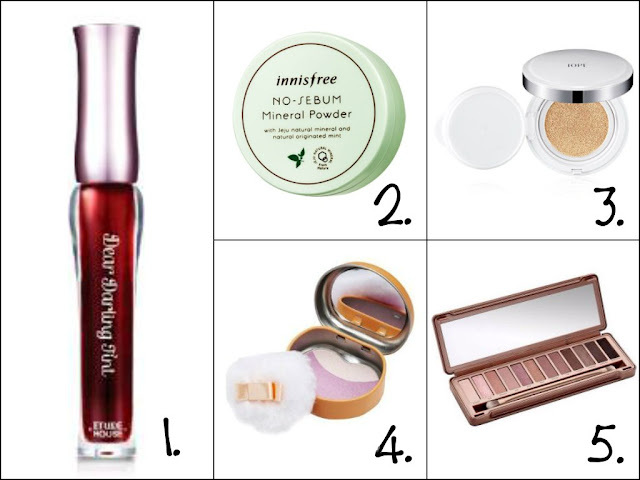 I haven't done a wish list since about Spring/Summer time, so I thought I would write a new one but this time on the make-up I've been eyeing up. I've realised since writing them all down that they are pretty much all Korean brands, and thinking about it I've really been into Korean cosmetics and have been researching and finding how amazing they are, so in the future I hope to try some of the products. Anyway, I should stop now before I start to ramble on too much and get into the actual wish list. 1. Etude House Dear Darling Tint 01 Berry Red - I personally don't wear any kind of lip product apart from lip balm as I find that lip glosses and lip sticks come of so easy. So since I've found out about lip tints I kind of really want to try them out. And after reading a lot, and I mean a lot, of reviews I've decided that the Etude house ones would be a good start. Plus I also love this colour, and feel like it would be such go good colour for the Autumn season. 2. Innisfree No Sebum Mineral Powder - Recently I smashed my Rimmel Stay Matte powder while travelling so I know I need a new one, and since quite a few youtubers I watch have recommended this one I read some reviews and fancy trying it out myself. Also people have said it is good for oily/combination skin which I have, and it's hard to find a powder that doesn't dry out my skin too much. 3. IOPE Air Cushion - Many youtubers I watch have raved about not only this product but other cushion foundations and BB creams as well, and I've kind of been hooked by the trend. The only thing I'm worried about before buying this product is if the colour will suit my skin tone as I haven't worn that much foundation in the past. 4. Skin Food Apple Can Multi-Blusher - This is actually a pretty new product to my wish list, but I kind of fell in love with the colour of this blush and the packaging. I don't actually own any blush at the moment but I would love to get one. 5. Urban Decay Naked 3 palette - This product has been on my wish list for a long time now, and still against the other Naked palettes this one still is the one that catches my eye every time. But unfortunately it's a little out of my price range, just have to add it to my Christmas list then. That's all for my wish list. What products are you loving at the moment? And what are you wishing for?